DURHAM, North Carolina -- One of Duke's shortest players kept finding ways to score on No. 15 Florida State's long, tall defenders. 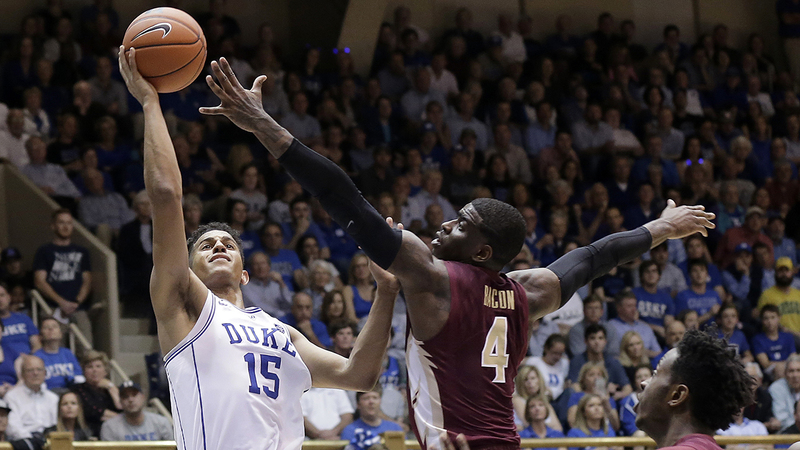 Freshman guard Frank Jackson - all 6-foot-3 of him - drove the lane, shot 3-pointers over the Seminoles' outstretched fingertips and gave the 17th-ranked Blue Devils all the cushion they needed. Jackson scored a season-best 22 points and Duke beat Florida State 75-70 on Tuesday night. "Change of pace, a lot of shot fakes, floaters," Jackson said. "They really were athletic, just a big team. I think the first time we played them, we kind of didn't know what to expect. This time around, we were able to study, we progressively got better as the season went along." It was a memorable senior night for Duke senior Amile Jefferson on Tuesday. Amile Jefferson, playing in his final game at Cameron Indoor Stadium, added 14 points and 11 rebounds while Luke Kennard finished with 17 points for the Blue Devils (23-7, 11-6 Atlantic Coast Conference). Jayson Tatum added 15 points for Duke, which avenged a 16-point loss last month in Tallahassee, held Florida State 14 points below its scoring average and snapped a two-game losing streak that cost the Blue Devils a top-10 ranking but, according to Hall of Fame coach Mike Krzyzewski, does not qualify as a slump. "We're playing our butts off. ... We're not slumping," Krzyzewski said. "Our guys are playing great. They're fighting like crazy. But sometimes, you don't make that one-possession play, and our league is so unforgiving if you don't make that play." Dwayne Bacon scored 19 points and Xavier Rathan-Mayes had 15 for the Seminoles (23-7, 11-6), who had their two-game winning streak snapped. Florida State pulled to 71-63 on Bacon's free throw with 2:23 to play before Tatum countered with a jumper to put Duke up by 10 points. Jackson then rebounded Jonathan Isaac's missed 3 and Duke went to work on the clock, with Tatum grabbing a key rebound of his own miss to help the Blue Devils keep the ball away from the Seminoles until there were about 50 seconds remaining. Jackson helped Duke build a 19-point lead by scoring 13 points in the first 4 1/2 minutes of the second half, taking the game over with three 3s in that span. That included a heat-checker over the 6-10 Isaac that made it 49-30 with about 15 1/2 minutes left. "He was kind of playing off a little bit," Jackson said. "I kind of hesitated, I saw that he was playing off and I just knocked down the shot." Florida State: At least the Seminoles won't have to worry about any more road games. They fell to 3-6 in league road games, trailing all but one of them at halftime and falling behind by at least 15 points in each of the six defeats. They won't break the program record of 12 ACC victories - the best they can do is tie it. Duke: The Blue Devils didn't ask much of key guard Grayson Allen, who missed the Miami loss three days earlier with a lingering left ankle injury. Allen played just 16 minutes and finished with a season-low two points on 1-of-3 shooting, two rebounds and no assists. "We've got to get him healthy," Krzyzewski said, "because he's too valuable for us." Florida State's 7-footers had some serious early trouble finishing at the rim, with 7-0 Michael Ojo and 7-4 Christ Koumadje missing a series of layups that contributed to the Seminoles falling into that big hole. They got back in the game late after they went small - Ojo didn't play in the final 18 1/2 minutes, and Koumadje sat the entire second half. "We kind of ditched what we had normally been doing because we had such a difficult time running our offense," coach Leonard Hamilton said. "We went to a smaller lineup and attacked the basket off the dribble, got to the foul line a little bit and were able to create some offense by driving the ball to the basket." Allen and Rathan-Mayes got themselves tangled for the second straight year at Cameron. With about 8 minutes to play, Rathan-Mayes missed a jumper in the lane and fell to the court, and as he went back up court, Allen appeared to trip over the Florida State guard's right leg. The officials reviewed the play during a media timeout but did not call a foul. A year ago, Allen tripped Rathan-Mayes in the final seconds of Duke's victory here, earning a reprimand from the ACC office. Florida State: Concludes the regular season Saturday at home against its top rival, No. 25 Miami. Duke: Wraps up the regular season with its annual rivalry game at No. 5 North Carolina on Saturday night.